We’re excited to introduce a new, regular series to the Community Blog — Commenter Spotlight. We’ll be featuring commenters from communities across the Disqus network. 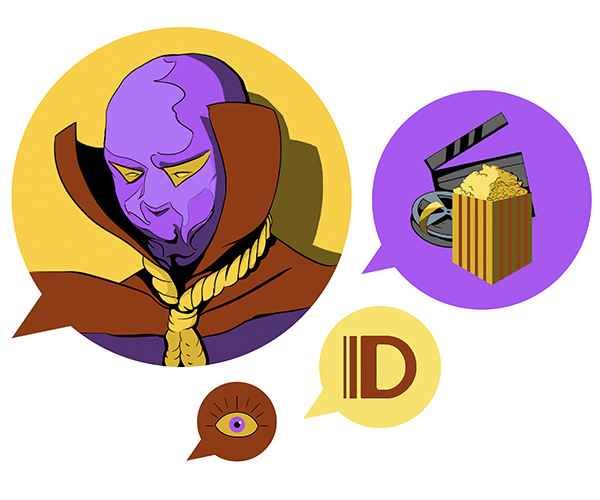 Each Commenter Spotlight will include a custom illustration (a loose representation of the commenter’s avatar and top-visited community), a 5-question profile, and a fun, extra section called “Up-vote or Down-vote?”. This last part is pretty straightforward: we ask the commenter if they would up-vote or down-vote 5 subjects, to give you a little sense of their personality (in addition to the profile). If you think this is cool, and know other commenters that you’d like to see featured, contact us by Twitter at @disqusfaves, or by email at favorites@disqus.com. To kick off the series, we’re happy to introduce Hooded Justice. A: The two sites that I visit most frequently are The Dissolve and The A.V. Club. They’re my main sources for entertainment news, movie reviews, TV recaps and so forth. I also check in at least once a week with Werewolf News, which keeps me abreast of any hair-raising developments on that front. A: Anything that’s thoughtfully written will generally inspire a thoughtful conversation. It also helps if the reader can tell that the author has a genuine investment in what they’re writing about. It’s no fun reading movie reviews by critics who seem to hate their jobs. That’s why The Dissolve is my top movie site. Everything they do stems from their love of film and their desire to share their enthusiasm with other people. A: I tend to read my comments over several times before hitting “Post as Hooded Justice.” Even though I’m not commenting under my own name, I think about how the things I write reflect on me as a person, so I always want to put my best face forward. Whether it’s a silly joke that I’ve dashed off in the heat of the moment or a carefully worded response that I hope will add something of substance to the discussion, I don’t really know how successful I’ve been until I see how other people respond to me. A: I chose Hooded Justice as my handle because he is by far my favorite character in Watchmen, which is one of my favorite comics of all time. Not only does he have a great, iconic look, but I find the fact that his true identity is never revealed to be highly appropriate since we’re all anonymous to some degree online. As for my avatar, there are a few from the Watchmen movie that I cycle between, but I like this particular one because it captures the actor playing Hooded Justice in a contemplative pose. Or maybe he’s just scratching his nose. Either way, it proves he’s human, just like me. A: The best feedback I ever get is when someone thanks me for pointing them in the direction of a film that they wouldn’t have otherwise sought out on their own. Apart from that, I’m just happy to be part of the conversation.